Tony & Lorna DeRoest Family Blog: Update "Readers digest version"
Sometimes in all the hussel and Bussel out there we forget to "stop and smell the Roses". I know I have. This August it's going to be Lorna and My's 32nd wedding anniversary. Wow! Cool! Where did the time go? I have five healthy children; none are in jail, and all are assets to society. It is times like these that I love to bask in, and reflect upon. Naomi and Michael live in Austin Texas creating a very successful life together. 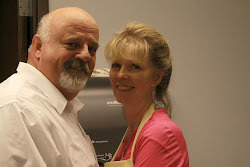 She helps direct a preschool/nursery of sorts, and He works for Cisco Systems on the leading edge of technology. Anthony and Chelsea reside in Albuequeque New Mexico. They got Married last July and already have been blessed with a little one. His name is Ethan Anthony and he is healthy too. Anthony is in his last stages of training towords his special forces with the US Air Force. Chelsea is now a full time mommy. Brent and Randi for the time being are in Rexburg, Idaho. Both were students, however Randi is now graduated and teaching in the school district. Brent will finish his schooling at BYU Idaho, this summer and then they will be moving to the Spokane Area. Rodney is taking a little time to evaluate his future. He is staying with us here in Portland. He's still in the Marine Corps reserve with three years to go. JoAnna spent the last year of High school in Rexburg with her Brother Brent. She graduated there, and is now a full time student at BYUI in the dorms. And loving it. Hello DeRoest friends and family! All is well here in Austin, Texas with Michael and me. Michael is studying for another CCIE exam and is due to take it on Friday July 6th, so any extra prayers for him would be great. This family blog thing is a pretty good idea, I think that I'll have to figure out how to start one for us... :) Oh, yeah and a minor correction-I work as an early preschool teacher with 20 two year olds. Not quite the director job but just as stressful, only in my position I get lots of hugs!